Previewing is a great way to see the changes you've made to your content without publishing your project. You can preview from Story View or from Normal View. Or, from any tab on the Storyline ribbon, click the Preview button. Or, in the lower-right corner of your Storyline window, click the icon to the left of the zoom percentage. Press Ctrl+F12 on your keyboard to preview the current slide. Or, press Shift+F12 on your keyboard to preview the current scene. Select: This allows you to choose a different slide in your course to preview. Replay: Click this button to replay the preview selection again. 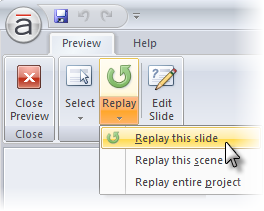 Or, you can click the arrow on this button and replay just the current slide, the current scene, or the entire project. Edit Slide: This takes you to Normal View of the slide you're currently previewing.